PDF files continue to be very widely used today, and offers many advantages than we actually realize. For example, PDF files have a very important quality that they cannot be altered after it has been created, without leaving behind a digital record. For that reason, it is recognized and accepted in business settings and also in the court of law. Lets say you have a paper document that you need to submit for to a court or another organization, and you have everything you need in the office. Printers, scanners, copiers, but you are at a total lost of how do you create a PDF from paper document. Can I use the flatbed scanner? How to create PDF from scanner? The answer is you could import the data from the scanner or transfer it over to a desktop computer, then make use of different of a word processor like Microsoft Word to convert it to PDF. However, if you have multiple documents to convert into PDF from scanner per day, then it is going to be extremely time consuming. For that, we will recommend using a scanner app on your mobile phone that works far better and faster than using a scanner. 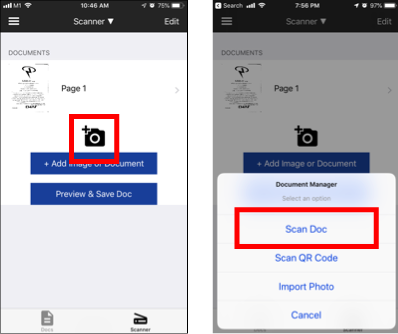 Scanner apps on iPhone offer the simplicity and speed to get a paper document converted into a PDF document, compared to using tradition office equiment and without using smartphone. How scanner apps work is they allow you to 'scan' a document simply by pointing your phone camera at the document and taking a picture. 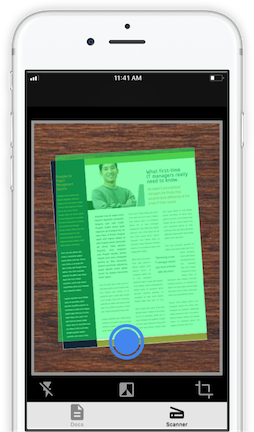 The scanner app will convert image into pdf for your documents and photos automatically. This eliminates the need for additional hardware such as flatbed scanner, all-in-one copies, and save you time from figuring out how to use them and also time spent to troubleshoot when something goes wrong. Here are 3 very easy steps you can use to get your document scanned into PDF, within less than 5 minutes. Download PDF Scanner Pro by Appsverse from The Apple App Store. Once downloaded, launch the app, and tap on the icon which looks like a camera with a '+' plus sign. 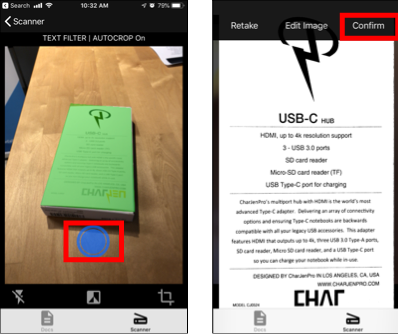 You can choose either to 'Scan Doc' (take new scan with camera) or 'Import photo' (upload existing image from camera roll). After selecting to scan document using camera, you should now see PDF Scanner Pro in camera mode. Simply point your camera at any item, paper, document you want to scan, and press shoot to capture. You photo will be converted into a scan automatically. 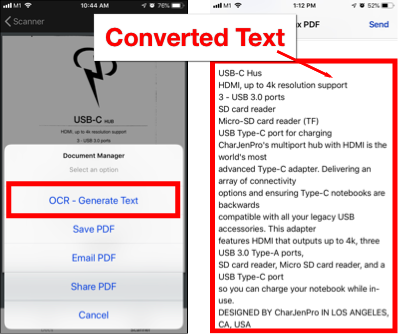 The next step to convert scan to PDF is really simple. Select the Share icon on the top right hand, and select 'Save PDF'. And you are done! Your document is now digitalized in PDF format. 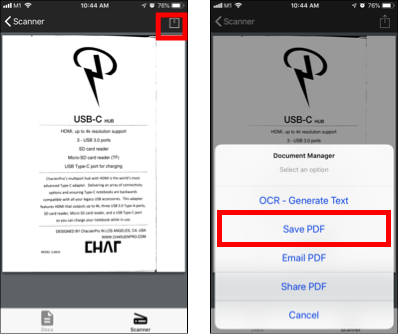 Use PDF Scanner Pro to scan receipts, documents, letters, books on iPhone. PDF Scanner Pro also offers advanced features such as Optical Character Recognition (OCR), where your document instantly gets converted into text. You can use it to convert books to words and texts. After converting scan to PDF file, you can send it so someone or yourself via email. Select 'Email PDF' from the on-screen options and your PDF should appear in your email app and ready to be emailed to anyone. 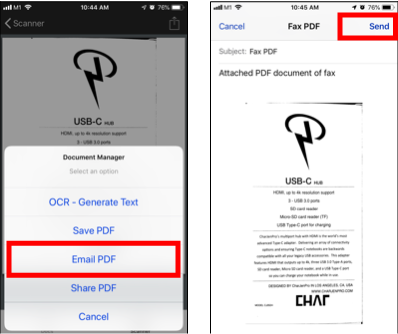 If you need to send the scan as fax, check out our guide to directly send fax from iPhone. PDF Scanner Pro is the easiest way create PDF from scanner. Just snap the photo of your document and it is ready to be saved and converted as a PDF file. PDF Scanner Pro is the top rated scanner PDF app on the iOS App Store, with over 1 Million+ Downloads, 4.5 Stars and 1,200++ Ratings on the iOS App Store as of October 2018. If you need a quick and productive way to create PDF from scanner in less than 5 minutes, you should download PDF Scanner Pro by Appsverse. Will I hurt my eyes when looking into a document scanner? How do you scan with your iPhone?